Up until last weekend, the Rolex 24 hours at Daytona was the only professional twice-around-the-clock race in the United States but all that changed after COTA hosted such an event for GT and touring cars as Dutch organization Creventic made its North-American debut after organizing a number of successful series in Europe. Before delving into what went on at the Circuit Of The Americas at the end of last week when the second ever professional 24 Hours race was held in the U.S., let’s look a bit at Creventic’s history. The Dutch organization which was behind this event, although it was sanctioned by the SCCA, is not new in the motorsport scene. In fact, their first hit came 11 years ago with the very first Dubai 24 Hours when they realized the potential of the Middle Eastern market and the appetite to race at the Dubai Autodrome which was also a host of the FIA GT at the time. The race in Dubai grew to the point where it’s a staple of the endurance racing calendar and, along with the Bathurst 12 Hours and Daytona 24 Hours, the kick starter of the season. On the back of that success, Creventic looked to build a series of endurance races for the cars they welcomed at Dubai on other European tracks. As such, the 24H Series was created and catered for 12-hour and 24-hour-long events. The series expanded and two more championships were added in the last couple of years: the 24H Touring Car Endurance Series and the 24H Proto Series. Last weekend’s race, though, was only part of the inaugural "Championship of Continents" and was run to 24H Series rules. The rules are much more liberal than what you’re used to see in your average IMSA-sanctioned or SRO-sanctioned races. If you’ve ever tuned in to the Nurburgring 24 Hours race or the VLN championship also held on the Nordschleife, you will be in the know as to what kinds of cars are allowed in this series. Basically, you’ve got from GT3 machinery to slower touring cars and "endurance specials." In short, A6 is the class dedicated to GT3 cars, and it has been split more recently into A6-Pro and A6-Am, with the latter being different because the driver lineups are made up of mostly gentleman drivers and the whole crew must not go quicker than their set delta time. A6-Pro doesn’t have a delta time that the drivers should worry about. Just below you have the SP3/GT4 class for GT4 machinery (naturally) and other modified "endurance specials" that are balanced to fight the GT4 cars. Then there’s SP2 for Supercup-spec 991s and other modified exotica such as the MARC Cars Australia Mazdas and Fords with their beefed up V8s. Other slower Porsche 911 Cup cars are welcome within the confines of the 991 class while touring cars run in three classes: TCR, A3, and A2. While the TCR class is self-explanatory, the other two categories pit against each other varied machinery from small Clios and Toyotas, to slightly modified BMWs, Hondas, and many others in between. 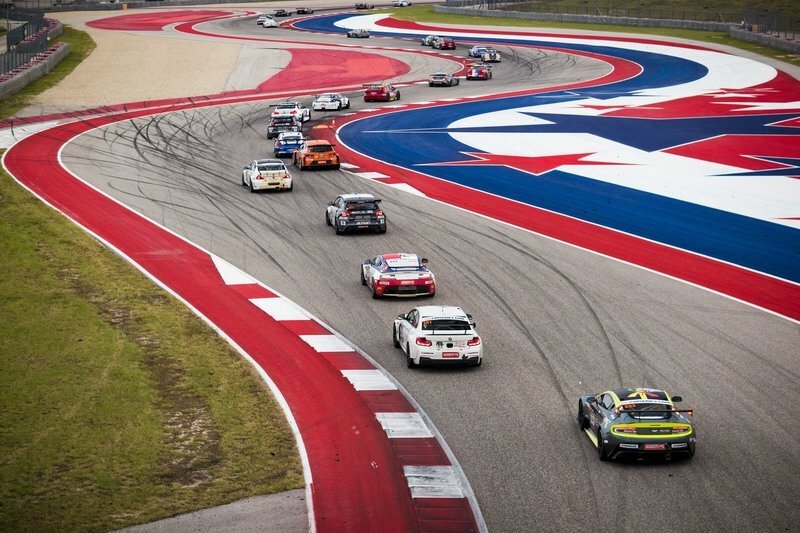 All in all, what you got if you visited COTA last weekend was a colorful 40-odd cars grid including top-of-the-line GT3 cars from Mercedes-Benz, Audi or Porsche as well as a couple of Honda Civics and a funky Peugeot RCZ. As for American flavor, there was plenty with a number of local teams joining in addition to an ex-GTE Corvette C6.R ZR.1 entered by V8 Racing from the Netherlands. Risi Competizione were also slated to run but could not find customers to fill the seats of their two 488 GT3s. Callaway Competition’s C7.R GT3 was a car that should have made its North-American debut but that didn’t happen either, although GM did give it its blessing since the Cadillac program has ended. We might, though, see such Corvettes in PWC or IMSA GTD in 2018. IMSA regular Jeroen Bleekemolen returned to German outfit Black Falcon for this race and promptly set the fastest time in qualifying, a 2:06.461 around the Austin, Texas, circuit. Manthey Racing’s No. 13 Porsche lined up second just ahead of Herberth Motorsport’s identical Porsche. The car ran briefly in the session due to some problems so the team was quite pleased with the third fastest time. 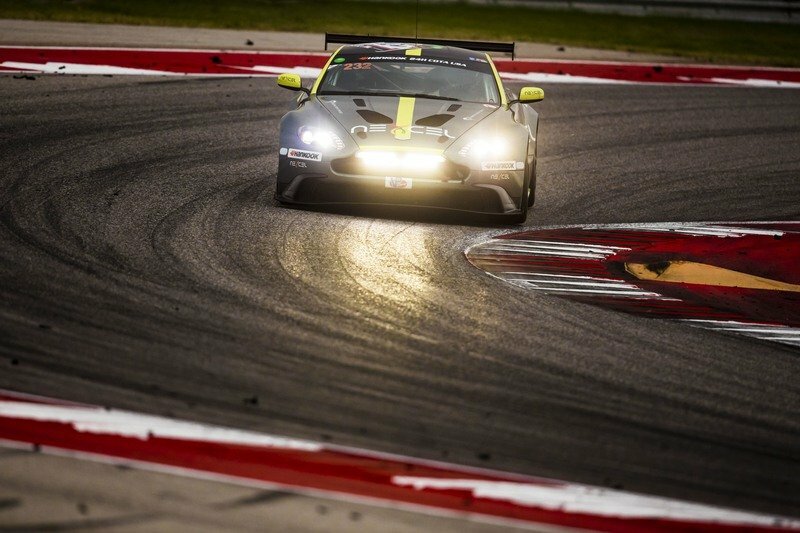 The 2017 Dubai 24 Hours champions were looking to complete the circle by also taking the `Champions of Continents` crown with a victory at COTA. Meanwhile, 2017 24H Series GT champion team Hofor Racing was quickest in A6-Am. Seventh overall and second in A6-Am was the Leipert Racing Lamborghini Huracan Super Trofeo which was ahead of the V8 Racing Corvette. PROsport Performance continued their tour de force by taking pole in the 991 class, which they have consistently dominated all through 2017. Espenlaub, Putman, and Foster were 1,5 seconds quicker than the second-placed Apo Sport Porsche. The No. 85 crew was another one of the "Champions of Continents" contenders. MARC Cars edged out the not-yet-homologated Mercedes-Benz AMG GTR GT4 of Winward/HTP in SP2. An Aston-Martin was quickest in SP3 but it wasn’t the works Aston-Martin Lagonda entry, but the Speedworks one. That, though, is a different Vantage. The polesitters ran a GT4 car while the works team had a GT8 model they qualified third. There were a number of incidents during qualifying, including a big accident for the No. 41 Brookspeed Porsche Cayman GT4, which caused one of the two red flag periods. 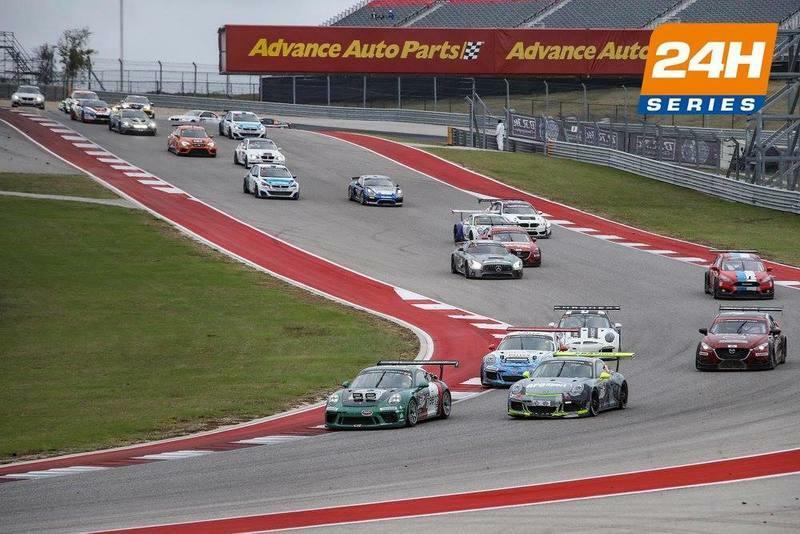 Due to noise restrictions in place in the Austin area, the race could not be run 24 hours without interruptions. As such, Creventic and the SCCA decided to split the event in two: 14 hours of racing rolled by on Saturday with the final 10 being run on Sunday. As per usual with the Creventic split races, the cars are parked in parc ferme after the first bit of running and anyone who decides to work on their car during the night receives a hefty 10-lap penalty. The following day, the race resumes via another rolling start with the cars positioned in the order in which they finished the first part and with the gaps intact. The first part of the race can be described as "business as usual" for Herberth Motorsport, which took over the lead from Black Falcon and was out front after 14 hours. The No. 911 car of Daniel Allemann, Robert Renauer, Ralf Bohn and Alfred Renauer was already a lap ahead of the No. 3 Mercedes of Ben Keating, Jeroen Bleekemolen, Luca Stolz and Abdulaziz Al Faisal. The two cars, though, fought on track on a number of occasions. Third was the ROFGO Racing Gulf-livered AMG GT GT3 with number 31 of Roald Goethe, Stuart Hall, Nicolas Minassian and Jamie Campbell-Walter. Their gearbox, though, was in bad shape and the crew changed it which threw them 10 laps away from the top guys. As such, third in A6-Pro when the race resumed was the No. 13 Manthey Racing Porsche while Car Collection Motorsport led A6-Am with the No. 34 car. The sister No. 33 R8 LMS had problems and dropped back through the pack. So much so that it’s out of the top three in class. It may not seem like much but, then again, the second-placed Corvette of V8 Racing was already 10 laps down after 14 hours. Hofor Racing were already out of the race after a serious accident for the No. 1 Mercedes, a truly unexpected turn of events for the team that moved from A6-Am to A6-Pro. PROsport Performance led in the 991 class with the No. 85 while MARC Cars Australia led SP2 with the No. 210 Mazda-bodied car. Brookspeed led in SP3 with a Porsche Cayman while the No. 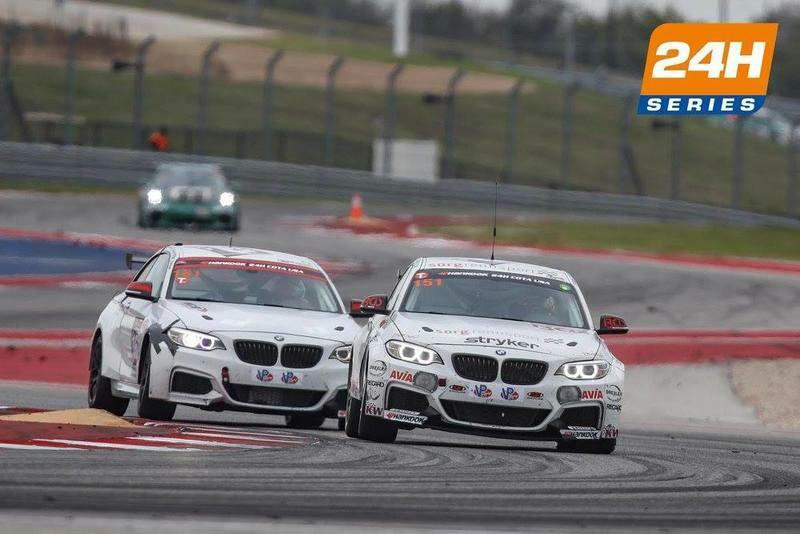 158 BMW led the CUP1 class which is dedicated to BMW M235i cars. Team Altran Peugeot led in TCR and another Peugeot, that of Team Eva Solo/Jonsson Consulting, leads A2 ahead of the two works Hondas. As per the rules, after the 12-hours mark, teams had to make a long stop to replace brake pads. Herberth Motorsport did their stop just as the No. 34 Audi, which I’ve mentioned already as being hit by problems, was being extinguished after a fire. That was, in fact, the only Code 60 neutralization of the day and it helped Herberth bridge an even larger gap which was two laps by the end of the final 10 hours. Black Falcon Motorsport finished second overall, but the `Champions of Continents` were the crew of Team Herberth Motorsport. Third overall was the No. 13 Manthey Racing Porsche in which young Norwegian Dennis Olsen starred. Car Collection beat V8 Racing in A6-Am by finishing fourth overall with their sole surviving R8 LMS. PROsport Performance never relinquished the lead in the 991 category and went on to comfortably bag the win. They finished sixth overall while second in class was American team Freem USA which had just acquired its Porsche 991 GT3 prior to the event. 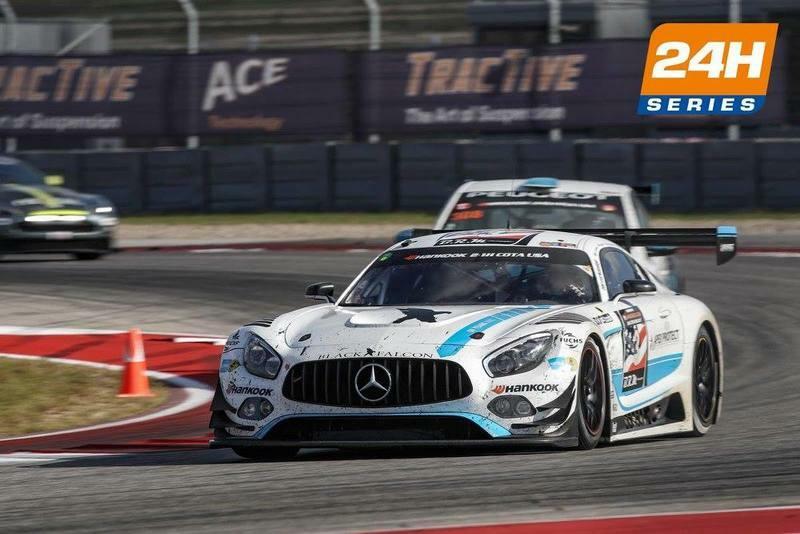 With both Mercedes-Benz AMG GTR GT4 cars slowed by teething reliability problems, MARC Cars Australia walked away with a 1-2 in the category. Team Altran Peugeot won in TCR, the French car finishing just ahead of the SP3-winning Brookspeed Porsche No. 41 – the same car that was (almost) trashed in qualifying. Second in this class was the Aston-Martin Lagonda-entered Vantage which was slowed down by problems and lost the lead before half distance. Team Eva’s Peugeot beat the two Civics in A2. Only seven cars were listed as official retirements.